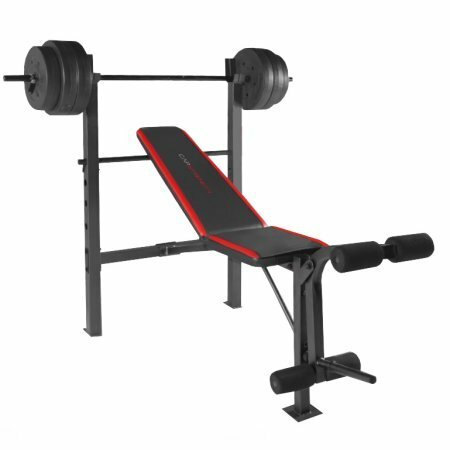 CAP Barbell's Standard Combo Weight Bench with 100-pound Barbell Set is the perfect starter bench. Designed with a compact frame design and easy assembly. The set also includes a 100-pound vinyl weight set. The ideal set for home use. The perfect starter bench. The ideal set for home use. 4-roll leg developer for working quads, hamstrings, glutes and hip-flexors. Designed with a compact frame design. Back rest is made of plywood and features an adjustable multi-position back pad for chest press and incline chest press exercises. Build and develop your quads, hamstrings, glutes and hip-flexors with the 4-roll leg developer. Includes a 100 lb vinyl weight set that contains two 10 lb weights, four 20 lb weights, 2 spring collars and 1 steel bar. If you have any questions about this product by CAP Strength, contact us by completing and submitting the form below. If you are looking for a specif part number, please include it with your message.